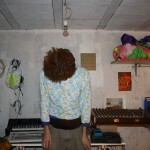 "One half of Laser Poodle, Antwerp resident Fyoelk, who also runs the cassette label Stenze Quo, has been making music on his own going back to 2006. His elasticated machine dance music is pulling tribal rhythms, syncopated synths and outer limits electronics together into a raveled whole. Amsterdam's 'No Label', an offspring of Rush Hour Recordings, released his 12" EP 'Klaus' in 2015."